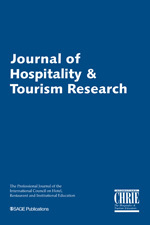 “A Case Study of a Culinary Tourism Campaign in Germany: Implications for Strategy Making and Successful Implementation” was published by Michael C. Ottenbacher, Heilbronn University, and Robert J. Harrington, University of Arkansas, in OnlineFirst on July 18th, 2011 in the Journal of Hospitality & Tourism Research. Dr. Ottenbacher kindly provided the following thoughts on the article. There appears to be substantial differences in what participants view as “what is” versus “what should be” for culinary tourism initiative success This case study provides some interesting findings tied to the notion of the strategic process and how these theoretical concepts of strategy are applied to a culinary tourism situation. While the longstanding academic debate between the planning and learning approaches to the strategic management has merit for leadership, one of the potential downsides of allowing strategies emerge over time (learning approach) is the negative perception by regional “followers”. The development and implementation of this regionally-driven process provides support for the impact of having a clearly defined strategy and the need for cooperation among stakeholders in its development. This approach appears to support the integrative strategic approach integrating strategy formulation and implementation as an iterative process for culinary tourism strategy development. The objective of this case study is to explore the key issues in the strategy-making process and implementation of a culinary tourism campaign in a region that has recently implemented a culinary tourism strategy and promotion. The study highlights several issues for other regions wishing to develop a culinary tourism strategy and successfully implement the initiative. Both authors teach, research and publish in the areas of hospitality and tourism management, strategic management and culinary. The reviewers provided constructive feedback and thus there were additions in the methodology section and mainly changes in the literature and discussion parts. This entry was posted in Tourism and tagged culinary tourism, strategy in tourism, tourism in Germany by Cynthia Nalevanko, Senior Editor, SAGE Publishing. Bookmark the permalink. After going over a few of the articles on your blog, I honestly appreciate your way of blogging.